The 6 in. x 24 in. 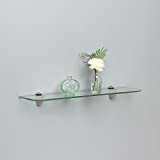 Satin Nickel Glass Decorative Shelf Kit features smooth lines and small brackets for a contemporary look. The tempered glass provides strength. The clear glass allows this kit to mesh with many home decors. Easy to install for any beginner, requiring only a cordless drill with a 3/8 bit and a Phillips head screwdriver. Please note, you will need to be able to locate your studs. If you are unsure a stud finder is helpful to have for the install. 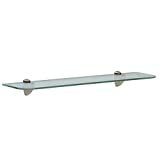 Interested in the Shelf-Made KT-0134-624SN Glass Shelf Kit, Satin Nickel, 6-Inch by 24-Inch? Is the price too high? You can easily price watch this product and we'll notify you when the price reaches your target.